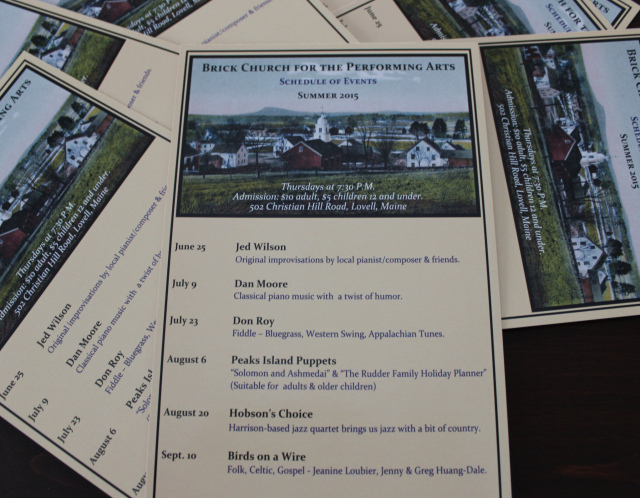 The 2015 Schedule of Events for Lovell's Brick Church for the Performing Arts is all set. The season opens on Thursday June 25th at 7:30 pm with local artist Jed Wilson. The remaining schedule includes both Brick Church favorites and some performers that are new to Lovell. If you would like your own 2015 magnet schedule, please contact me at stan@fairpoint.net or stop by the Kezar Realty office. Click here to read Brick Church President Susie Mosca's letter that discusses the upcoming season as well as the recent and future work projects on the historic building in Lovell Village. The 2014 Schedule of Events for Lovell's Brick Church for the Performing Arts is all set. The season opens on Sunday June 1st at 4 pm with the Mt. Washington Valley singing group Da Capo. The regular Thursday night schedule begins on June 12th with Mountain Top Music and the Denmark Vocal Cabaret where they will be singing old and new favorites from Broadway & beyond. If you would like your own 2014 magnet schedule, please contact me at stan@fairpoint.net or stop by the Kezar Realty office. Click here to read Brick Church President Susie Mosca's letter that discusses the upcoming season as well as the recent and future work projects on the historic building in Lovell Village. After years of raising funds for the repair of the belfry and completing the task in 2012, the Brick Church for the Performing Arts in Lovell Village is ready for its eighth season of programming. To commemorate the belfry's restoration, there will be a very special performance on Sunday, June 2nd at 2 pm. Ring in the Belfry will be a concert of handbell music, choral singing and a hymn sing. Area churches (Fryeburg New Church, Lovell United Church of Christ the First Congregational Church of Fryeburg and the Ridley Park Presbyterian Church) are participating and will provide a festive mix of gospel, jazz, hymn singing as well as a few surprises. Proceeds from the show will support the participating churches. Come in and join the fun! Tickets are $10 for adults and $5 for children. Call 207-925-1500 for more information. Be sure to check out the exciting 2013 schedule at the Brick Church's web site: Lovell Brick Church for the Performing Arts. In addition to many returning favorites, there are a number of new performers. Remember to visit and support this Lovell treasure! 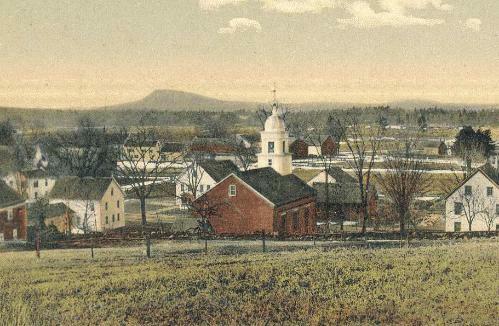 Great old photo of the church. Al tells me that when he was very young the older kids used to ski down this hill. There was no fence there and the snow was so deep it covered the stone wall making a natural jump. The kids would soar over it and ski to the bottom at the side of the church. See you at the concert this afternoon! After a busy and successful 2012 Summer Season, work began on the restoration of the belfry that sits on top of Lovell's Brick Church for the Performing Arts. Several years of fundraising provided a sufficient amount of money for the complicated process to proceed. There was also an element of uncertainty as to exactly what amount of rot would be found once layers of flashing and shingles were removed. 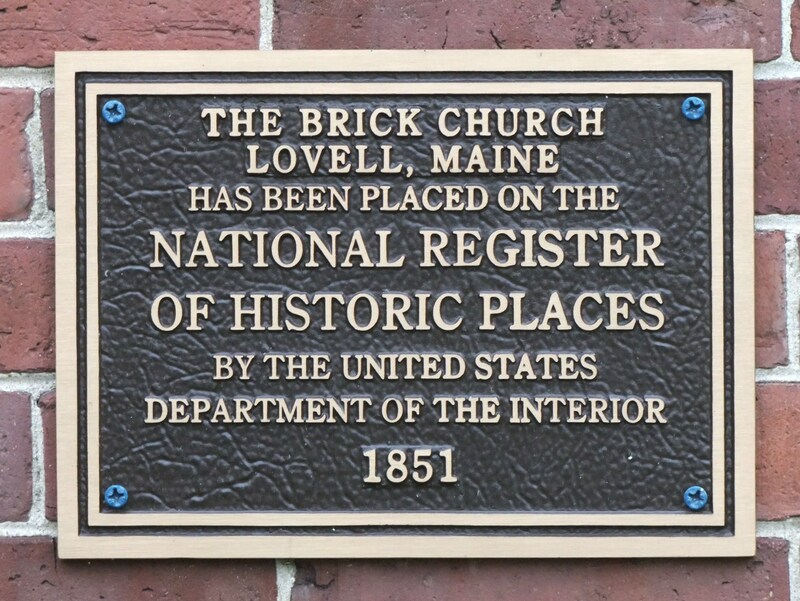 Since 1850, the Brick Church has always been an important institution in Lovell but with its location off of Route 5, not everyone is aware of this beautiful structure. It is worthwhile to take a detour up Christian Hill Road to see the finished work. Although interior restoration continues and funds need to be raised for that, when next summer rolls around, please be sure to attend a concert or two. The building is a gem!